A delegation led by Sevmash officials visited Karwar to inspect the Indian Navy’s flagship aircraft carrier. Talks are on for post-warranty maintenance. A Sevmash-led delegation comprising of representatives of Rosoboronexport, Nevskoye PKB, and Salyut inspected the INS Vikramaditya on the invitation of the Indian Navy, Morskoi Vestnik reported on its website. 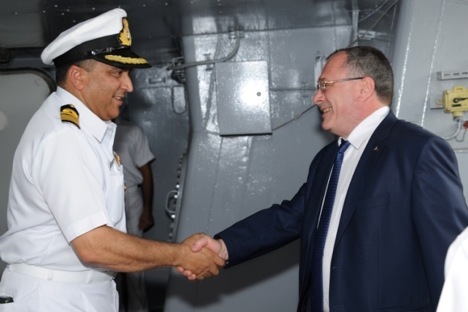 The Sevmash delegation was led by General Director Mikhail Budnichenko was welcomed by Vice Admiral Ashok Subhedar, Director General of Naval Projects (Mumbai). Indian and Russian representatives boarded the Vikramaditya and familiarised themselves with the current condition of the vessel, Morskoi Vestnik (MV) added. The aircraft carrier performed faultlessly during her very difficult passage from Russia to India and she is now in active service with the Indian Navy. Aircraft regularly operate from the vessel at sea. Indian pilots are undergoing training led by pilots from the MiG Corporation. Also on board during naval exercises are a guarantee group made up of 54 specialists from Sevmash as well as other contract partners. During the inspection, Vice-Admiral Subhedar handed Mikhail Budnichenko a letter on behalf of the Indian Navy in which the work of specialists from the paint-insulation and assembly workshops were highly praised, MV added. Working in India, Russian shipwrights completed a planned replacement of the surface on the aircraft carrier’s flight deck. “The group of Russian specialists demonstrated a high degree of professionalism and competence in carrying out the most complex of painting tasks in high temperatures and high humidity, which are diametrically opposed to climatic conditions in Russia. The specialists earned the complete understanding and trust of the ship’s crew, which provided excellent results,” MV quoted the Indian Navy as writing in the letter. Sevmash representative also met senior Indian Naval officials in Delhi. Issues concerning the Vikramaditya’s post-warranty maintenance were discussed at these talks, MV said. The warranty for maintenance of the vessel by the Severodvinsk enterprise expires on November 16, 2014. The Indian military put forward a proposal to extend future cooperation and ensure that the vessel be maintained by Russian specialists throughout her entire life cycle. Further talks will be held on post-warranty maintenance this month, according to Morskoi Vestnik.